The conversion of atmospheric nitrogen into nitrogenous compounds is nitrogen fixation.You have learnt about the bacterium Rhizobium. It is involved in the fixation of nitrogen in leguminous plants (pulses). Recall that Rhizobium lives in the root nodules of leguminous plants, such as beans and peas, with which it has a symbiotic relationship. Sometimes nitrogen gets fixed through the action of lightning. But you know that the amount of nitrogen in the atmosphere remains constant. Our atmosphere has 78% nitrogen gas. Nitrogen is one of the essential constituents of all living organisms as part of proteins, chlorophyll, nucleic acids and vitamins. The atmospheric nitrogen cannot be taken directly by plants and animals. Certain bacteria and blue green algae present in the soil fix nitrogen from the atmosphere and convert into compounds of nitrogen. Once nitrogen is converted into these usable compounds, it can be utilised by plants from the soil through their root system. Nitrogen is then used for the synthesis of plant proteins and other compounds. Animals feeding on plants get these proteins and other nitrogen compounds. When plants and animals die, bacteria and fungi present in the soil convert the nitrogenous wastes into nitrogenous compounds to be used by plants again. Certain other bacteria convert some part of them to nitrogen gas which goes back into the atmosphere. As a result, the percentage of nitrogen in the atmosphere remains more or less constant. 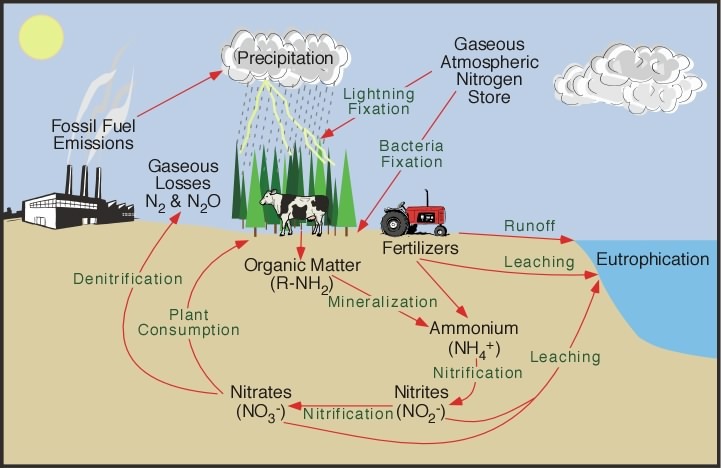 The circulation of nitrogen between organisms and the atmosphere is called the nitrogen cycle.Some microorganisms reside in the root nodules of leguminous plants and fix nitrogen from the air into the soil, and increase soil fertility. Nitrogen is also fixed by lightning to a small extent. Microorganisms in soil decompose harmful and smelly substances, leading to a cleaner environment. 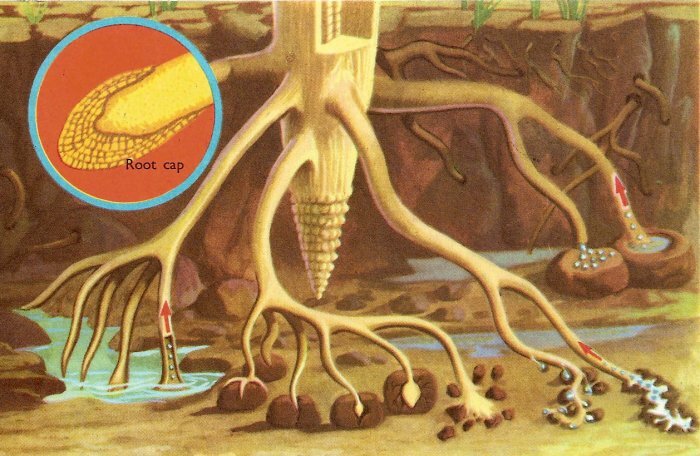 Some microorganisms reside in the root nodules of leguminous plants. They can fix nitrogen from air into soil and increase the soil fertility.  Some bacteria and blue green algae present in the soil fix nitrogen from the atmosphere and convert into nitrogenous compounds.  Certain bacteria convert compounds of nitrogen present in the soil into nitrogen gas which is released to the atmosphere.